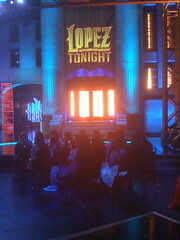 On Wednesday June 23rd, the LA Internship program students attended a taping of Lopez Tonight. It was the 100th episode and George Lopez had a ton in store for his audience. We watched “best moments” and “blooper” reels. Celebrities sent their congratulations to George via video. Unfortunately, guest Kobe Bryant was not at our taping due to scheduling conflicts, but we watched his segment taped earlier as he shared his Larry O’Brien NBA Championship Trophy with George. Then, guest Louis C.K. did a stand-up bit and interview. 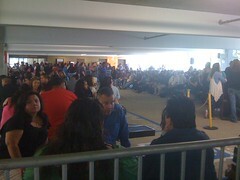 The crowd waiting for "Lopez Tonight"